This homemade chicken soup is the last of 3 meals you can make from one chicken. 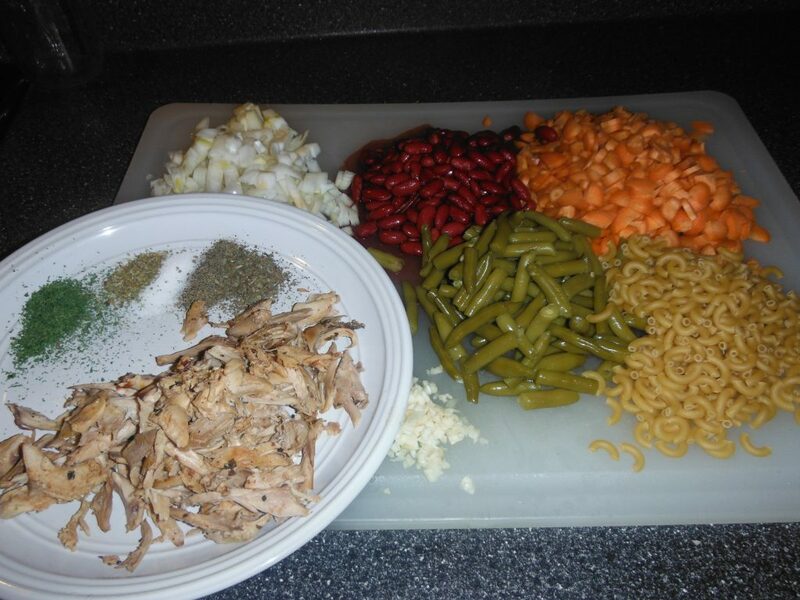 If you missed the start with Easy Italian Crock Pot Chicken click on the link to read that one. It is always best to start at the beginning. Then move on to the 2nd meal, Homemade Chicken Tortillas. At this point you will be all caught up and ready to move forward with this 3rd recipe. Just one of the ways you can stretch a dollar and eat healthy! Homemade chicken soup is the healthiest when it starts with homemade stock from local, pasture raised chickens. For those people who find the idea of making stock intimidating, please don’t. It really is as easy as adding water to a leftover chicken carcass, ham bone, beef bones or leftover roast. The bones are what makes the stock healthy and flavorful. Sounds like a great topic for an upcoming blog post don’t you think? Where do you get a chicken carcass? We get people who ask us if we sell chicken bones all of the time. The answer, that I have given only the most easy going people is, “yes!” “But it comes wrapped inside some lovely pasture raised chicken meat.” That’s usually not the answer they are looking for. We love the idea that so many people have discovered the brilliance in making their own stock and the health benefits that go along with it. Don’t take my word for it. Look it up. It is amazing! But for us, the reality is, we don’t sell just the bones. So where do you get a chicken carcass? If you check out our Kitchen Tip #4 or our Easy Italian Crock Pot Chicken Recipe or our Homemade Chicken Tortilla Recipe you will find a time saving, mouthwatering, healthy way to come up with a chicken carcass. And that my friends is the first step! Leftover chicken carcass and all the fat, scraps, etc. from the pan it was cooked in. This is my base for all chicken stock, but you can use any herbs that smell and taste good to you. 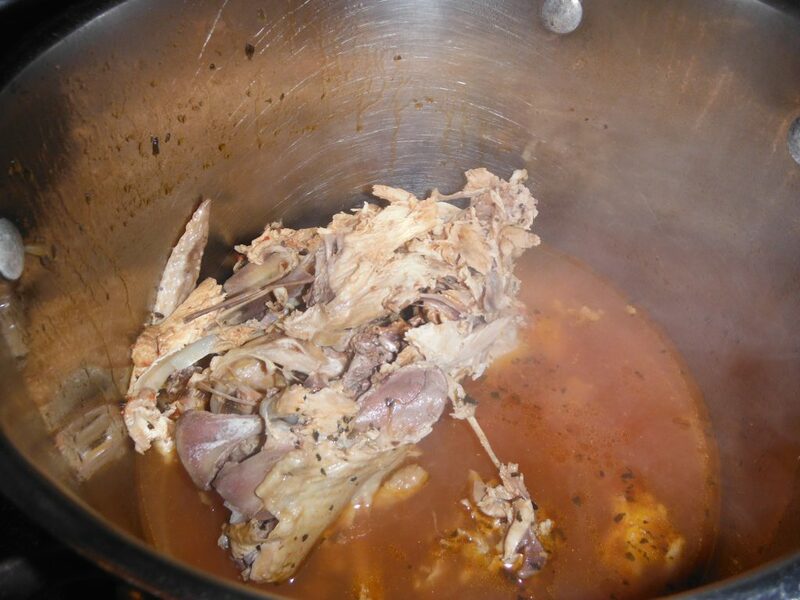 Place the leftover chicken carcass or other bone with meat in a stock pot or roasting pan. Add some water. Eight to ten cups is a good place to start. Keep in mind you are making a soup broth. So you want enough to get the meat off the bones as it is cooking, but you do not have to have the carcass covered. Here is where some flexibility comes in. You can add more water or have less water. As long as you don’t run the pan out of water, you will be fine. Add a generous amount of the above mentioned seasonings and garlic if you have it. Just toss the clove in, cut it up, crush it, mince it, it is your choice. The flavor will be there any way you do it! Put the cover on the pan and turn the heat on low. Bring it to a simmer (which means, just a few bubbles popping up here and there). You will not wreck anything if it comes to a full boil. Just turn it down a bit if it does. I know…it doesn’t look pretty. But when you are done, it will be pretty tasty! With your pan full of health and wellness happily bubbling on the stove, you have some time to do other things. Take a nap, go outside and enjoy some fresh air, grab a cup of tea and read a book, make some biscuits or a loaf of bread. Do whatever you want to, but make sure to enjoy the smell that will be permeating throughout your house. That is the smell of comfort! How do I know when my stock is done? Great question. And the simple answer: you will know. Remember, the meat is already cooked. You are simply taking the good out of the bones and allowing the seasoning to blend. You will have a delicious stock in as little as an hour or you can leave it simmering for up to 4 hours or longer. The choice is yours and there is no right or wrong choice, just make sure you don’t run out of liquid. Initially when you added your water it was clear “ish” . But after about an hour, take the lid off, if you have been able to wait that long, and you will see. There is now color in the water, which is the fat and goodness from the bones. That is flavor and health you are looking at. You are ready for the next step! Yes, at this point, you have made your very own chicken stock. You should be proud of yourself. Next, turn the heat off from under the pot and let the contents cool so that you can touch the meat and bones with your hands. Now is the time to cut up your veggies for the soup. Or if you prefer you can use canned or frozen and skip the cutting up step. So gather your veggies together, and this is the beauty: it’s your soup, you put in it whatever you want! I like the traditional onion, carrot, celery, mirepoix. The what? Go ahead, look it up and then dazzle your friends with your culinary verbiage. You can add potatoes, green beans, peas, corn, kale, you name it! If you choose fresh veggies, just make sure that you cut them and saute them in a little olive oil or butter to get them soft. Take your pot and pull out the big bones or pieces of meat. Yes, with your hands. They are the best tools you own. Put the bones and meat on a plate. Next get a pot large enough to contain your soup, put a colander on top. 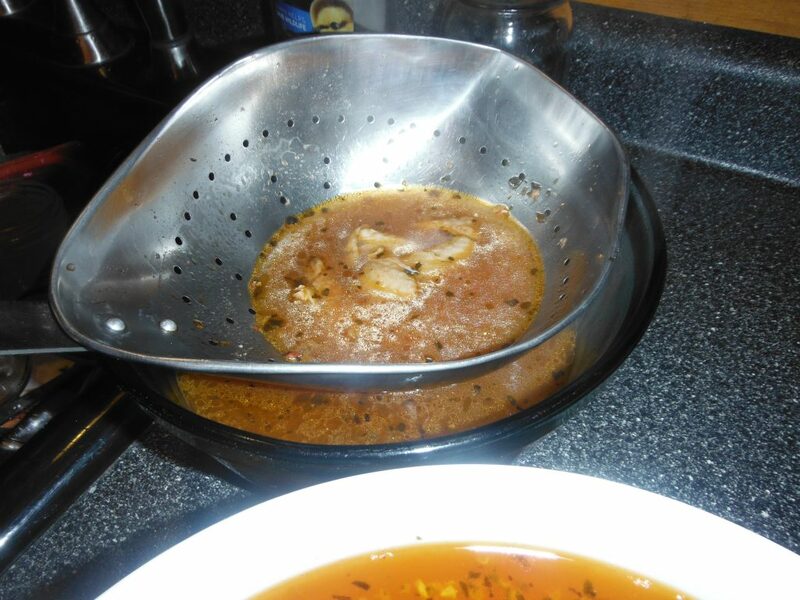 Slowly dump the broth and remaining contents into the colander. Oh, it smells so good! So right now, you have a pot with your homemade stock in it. A colander of bones and meat and a plate with bones and meat. Go through the bones and meat, again with your hands and put any remaining pieces of meat in the pot with your stock. It’s kind of like picking a “lobsta” only different. Put the bones in a bag they are ready for disposal. 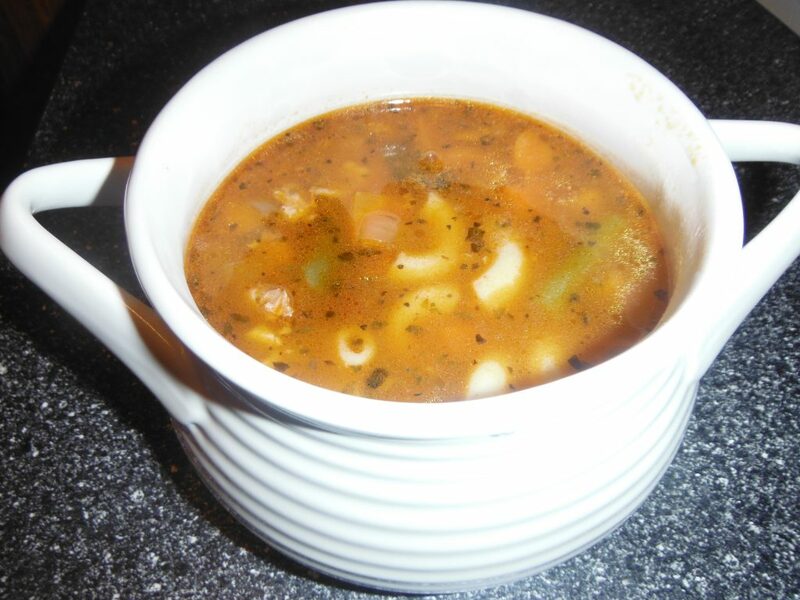 Take your sauteed fresh veggies, canned or frozen veggies and put them in the soup pot. Put the pot back on the burner and turn heat on low again. If you want to add some rice or pasta, you can cook them ahead and add them now, or you can add some uncooked. If you are adding dry uncooked rice or pasta, be sure to add another 4 cups or so of water as they will absorb your stock. (this is my preferred method) Heat until the noodles or rice are cooked. About a 1/2 hour, or until it is heated through if you are not cooking noodles or rice.